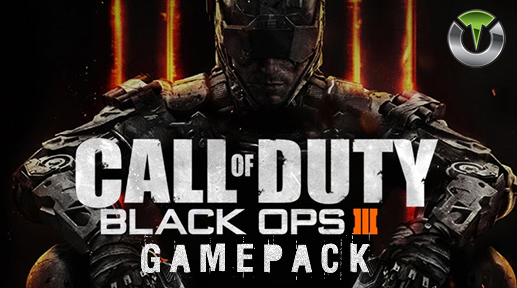 Call of Duty Black Ops 3 Gamepack for Titan One features an NEW and EXCLUSIVE Advanced Rapidfire MOD. 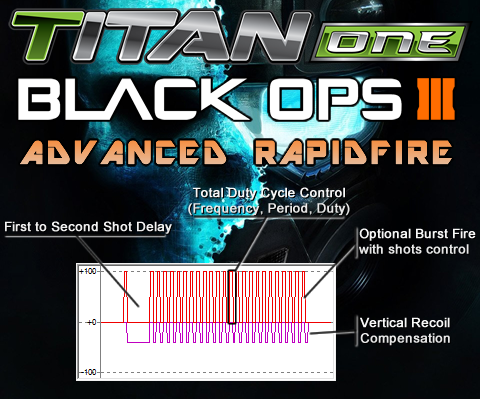 The new and exclusive Advanced Rapidfire MOD features an unprecedented control of the parameters and physics inherent to the weapons models of Black Ops 3, such: Rapidfire frequency, period and duty; First to second shot delay; Bustfire and Vertical recoil compensation. In Call of Duty, the soldier can arm himself with pistols in both hands in Akimbo mode. Firing both pistols means that the player must awkwardly pull both the left and right triggers. This can make aiming more difficult. When the Easy Akimbo MOD is turned on, pulling the right trigger alone will fire both pistols using Quick Rapidfire. 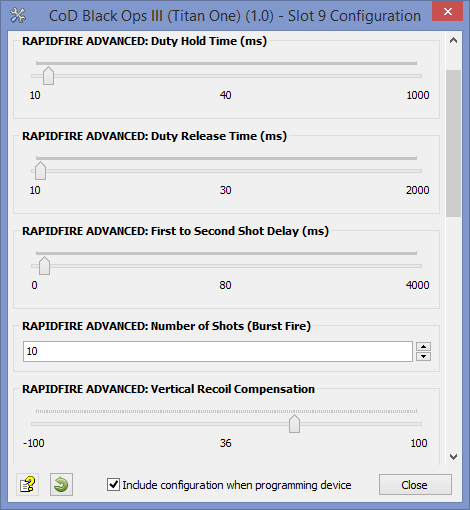 Similar to the drop shot option 1, but the drop action is also triggered when releasing the ADS button. Same as 1 but the Quick Scope is activated when the ADS (scope) button is FULLY pressed in less than 300 ms. Same as 1 but the Quick Scope is activated every time the ADS (scope) button is pressed. In this mode is not possible zooming on enemies.